· Superior All Day Protection from wetness and odor. Dry Idea is also doing a sweepstakes with $1000 in prizes. You can sign up by going HERE. Grand Prize is $500 and 20 winners will receive $50 for second place! I've used Dry Idea in the past but wasn't always impressed with the wetness of a roll-on. I thought what the heck and gave it another try when I got mine in the mail for this promotion however. I was actually surprised at how quickly it dried after application. I've been using it everyday for about a week now and really like that it lasts all day long even when I've been outside in the 90's heat. Glad I gave it another shot that's for sure! 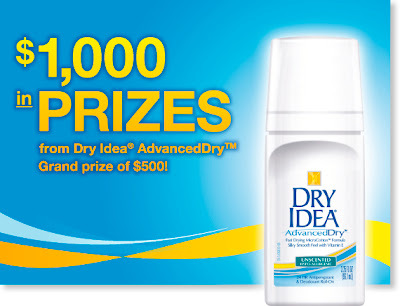 Win it: 3 lucky readers will each win a coupon for a FREE Dry Idea® Roll-On. This giveaway will end July 10th at 12:01 AM EST. The winner will have 48 hours to respond to my email. If no response, a new winner will be chosen. Open to residents of the US. I usually use Degree or Secret, so it'd be nice to try something different! I use Secret right now. I am currently using Dove :) Thank you! I use suave. It's what I've used since I was 11. I'm using Secret right now. I use different brand each time. I am currently using dove.